The signing of a legend. 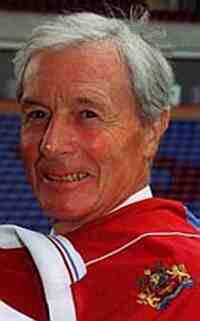 A Jimmy McIlroy 70th birthday special. The story starts in season 1949/50 which was our third season back in the old Division One. The season started well and when we beat Bolton Wanderers 1-0 away on Christmas Eve 1949 we were 5th in the table only 3 points off the top. Then things started to go wrong and we lost 3 and drew 6 of our next 9 matches scoring only 5 goals in the process and one of those was an own goal. In the process we had dropped to ninth place and out of contention for the Championship. It was patently obvious that we needed a forward and the Clarets management were well aware of this. So on March 3rd 1950 manager Frank Hill and Chairman Mr E.D. Kay set off for Belfast to watch an Irish Centre Forward who was supposedly attracting wide attention and had already been the subject of an enquiry from Burnley. This player was not Jimmy McIlroy. They returned empty handed and the manager was quoted as saying the following: "We will not agree to spending big money foolishly. We would sign a big cheque today if we thought we had the chance of the right type of player but it would be useless signing someone no better than the players already on the books" I'm sure you have noticed that this is almost word for word the same as Stan Ternent still says today! Things did not get any better and on March 11th we lost away to eventual Champions Portsmouth. The problem was that transfer deadline day was on March 16th so Frank Hill returned to Belfast to see if he could make his big signing. Once again he returned without his man and deadline day passed with no new faces at Turf Moor. He reiterated his earlier comments by saying that "I am not prepared to indulge in reckless spending". He also admitted that he had made enquiries about others but had been "flatly refused"
The reference to ‘others' is probably the first mention of Jimmy McIlroy in conjunction with Burnley Football Club because Jimmy had not been the original target of the scouting missions. Jimmy was born in the village of Lambeg near Belfast on October 25th 1931. As a junior he played for the Craigavad club near Bangor and was signed by Irish League club Glentoran in early 1949 aged 17. By the time he turned 18 a few months later he had already established himself in the Glentoran first team. On March 15th 1950 Burnley manager Frank Hill saw him play a starring role in Glentoran's 4-1 away win over Distillery, a match in which Jimmy also scored. He was rebuffed in his attempts to sign the original target and also in a bid to sign a forward from Wolves and so turned his attention to one of the ‘others'. This could have been a pivotal point in our history as there are those that believe that we would not have achieved our successes of the late 50's and early 60's without Jimmy McIlroy. 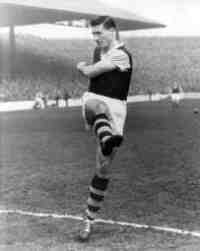 Seemingly things changed for Frank Hill because on March 21st 1950 only a few days after being ‘flatly refused' Jimmy walked into the corridors of Turf Moor for the first time having signed for a fee of around £6,000. The following day the Burnley Express greeted his arrival with maybe 6 inches of column space. When he departed 13 years later the same newspaper treated it as though there had been the death of a reigning monarch. On March 25th he made his competitive debut for the Clarets in a home reserve match against Chesterfield, which was won 4-1. Although he did not score he won a penalty and had numerous efforts saved by the Chesterfield keeper. Because he was signed after deadline day he wasn't eligible for the first team until the following season. The greatest to wear the Claret shirt? The crowd for the reserves had been swelled to 8,646 as a result of Jimmy's appearance and the Burnley Express had this to say about him "It was his general football skill which had the crowd talking in glowing terms. He was constantly in the limelight and his debut was more than satisfactory"
Early in the following season Harry Potts was transferred to Everton and Jimmy was brought into replace him. He made his first team debut 4 days short of his 19th birthday on October 21st 1950 in a 1-1 draw away at Sunderland and the rest, as they say, is history. I started off by saying that there is little doubt that Jimmy McIlroy is the greatest player ever to pull on a Burnley shirt. Well for me, and many others, there is NO doubt that he is the greatest ever Claret.